Working for a living today _ but also enjoying a rare day out of the office. It's really a shame that there's no way to review more than a couple of the startups at one of these conferences in a AP story. But I guess that's what Techcrunch is for. I found myself talking to a lot of people about how difficult it is for English speakers to know what's going on in European countries _ even in 2008, the main hurdle is language. Weren't the gods of technology going to come up with the universal translator like 5 years ago? And no, I don't think Babelfish cuts the mustard. I know there are a lot of hotshots out there with 7 languages or what have you, but for the rest of us, it's just not practical to try to keep abreast of what's going on in France, Germany, Scandinavian countries, Spain, the Benelux. 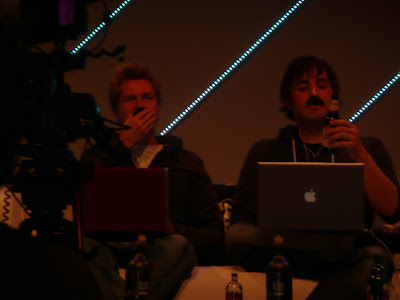 Anyhow the highlight of the conference for me personally was watching a recording of "Diggnation" live. If you've never seen the show, I highly recommend it. It's like Waynes World or Beevis and Butthead, only very smart. Plus it's a little bit nostalgic for me. 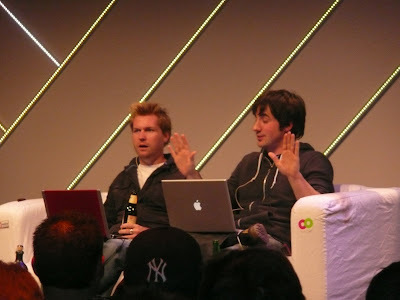 Kevin Rose and especially Alex Albrecht remind me so much of my high school friends back in California, and just being a teenager generally. That's a compliment _ they're just full of fun. Alex especially reminds me of my high school buddy Ben Levine, one of the world's funniest men, now working as a bass player for a reasonably famous band _ under a stage name. I grew my moustache _ such as it is _ especially for the show, so I'll take a picture before shaving it tomorrow. Never in 36 years have I done that before. Plus there was free beer. I would have liked to shown those 'dudes' around town, but I had to blitz back to domestic life. I'm not quite sure why I'm posting this video, given that the sound is so bad *and* in a week you can get it in high quality from their website. Just in case the sound is too bad: He's talking about a German researcher that scientifimagically demonstrated redheads are actually sexier than all other girls. Si non e vero, e bene trovato.